The Trick Is To Stay Alive! This movie is credited with the first strong female in a slasher film and redefines the genre. Jamie Lee Curtis, in her film debut, plays the title role of Laurie Strode. Laurie is not only book smart but has a strong sense of survival. She’s the ‘I’m gonna fight you tooth and nail’ type babysitter who doesn’t just scream and lay there making easy pickings for the killer. Watch out Michael Meyers, she’s no easy win. A classic film all the way! A must see for every true horror fan. Michael Meyers returns to Haddonfield, and the big screen, for one terrifying night on Thursday, October 29th with John Carpenter’s HALLOWEEN. 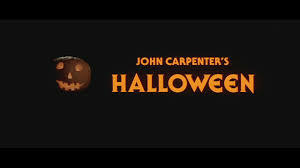 One of the most successful independent movies of all time, the original HALLOWEEN redefined the horror genre as we know it and has spawned a horror franchise of seven sequels. In 1963, six-year-old Michael stabbed his 15-year-old sister to death. Institutionalized for the next 15 years, Michael manages to escape and heads for his hometown of Haddonfield the day before Halloween. Meanwhile Laurie Strode, a serious student, is spending Halloween night babysitting for the neighbors. Little does she know the danger she and her friends are in with Michael on the prowl. This special one-night event will also feature an introduction with director John Carpenter, providing exclusive insights into his iconic horror indie. This entry was posted in Actresses, Directors, Film History, Horror and tagged Fathom Events, Halloween, Halloween movies, horror, Jamie Lee Curtis, John Carpenter, Michael Meyers, slasher films. Bookmark the permalink. Village of the Damned Children Halloween!